(Ph.D., UC Los Angeles, 1998) is a Professor with research interests in Geographic Information Systems (GIS), Remote Sensing, and Biogeography. 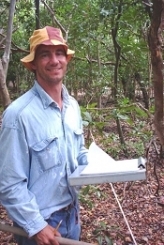 Professor Gillespie leads the EOS seminars and teaches classes in remote sensing and the geography of the tropics. Gillespie, T.W., Willis, K.S., Ostermann-Kelm, S., Longcore, T., Federico, F., Lee, L., and MacDonald, G.M. 2017. Inventorying and monitoring nighttime light distribution and dynamics in the Mediterranean coast network of southern California. Natural Areas Journal 37, 350-360. Gillespie, T.W., de Goede, J., Aguilar, L., Jenerette, G.D., Fricker, G.A., Avolio, M.L., Pincetl, S., Johnston, T., Clarke, L.W. and Pataki, D.E. 2017. Predicting tree species richness in urban forests. Urban Ecosystems 20, 839–849. Jenerette, G.D., Clarke, L.W., Avolio, M.L., Pataki, D.E., Gillespie, T.W., Pincetl, S., Nowak, D.J., Hutyra, L.R., McHale, M., McFadden, and Alonzo, J.P.M. 2016. Climate tolerance filters and trait choices shape continental patterns of urban tree biodiversity. Global Ecology and Biogeography 25, 1367-1376. Gillespie, T.W., Smith, M.L., Barron, S., Karla, K., and Rovzar, C. 2016. Predictive modelling for archaeological sites: Ashokan edicts from the Indian subcontinent. Current Science 110, 1916-1921. Rovzar, C., Gillespie, T.W., and Kawelo, K. 2016. Landscape to site variations in species distribution models for endangered plants. Forest Ecology and Management 369, 170-183. Smith, M.L., Gillespie, T.W., Barron, S., and Kalra, K. 2016. Finding history: the locational geography of Ashokan inscriptions in the Indian subcontinent. Antiquity 90, 376-392. Avolio, M., Pataki, D.E., Gillespie, T., Jenerette, G.D., McCarthy, H.R., Pincetl, S., and Weller-Clarke, L. 2015. Tree diversity in southern California’s urban forest: the interacting roles of social and environmental variables. Frontiers in Ecology and Evolution 3, 73. Slik, F. et al. 2015. An estimate of the number of tropical tree species. Proceedings of the National Academy of Sciences 112, 7472–7477. Fricker, A., Wolfe, G., Saatchi, S., and Gillespie, T.W. 2015. Predicting variation of tree species richness in tropical forest landscapes using high spatial resolution remote sensing. Ecological Applications 25, 1776–1789. Rocchini, D., Andreo, V., Förster, M., Garzon-Lopez C.X., Gutierrez, A.P., Gillespie, T.W., Hauffe, H.C., He, K.S., Kleinschmit, B., Mairota, P., Marcantonio, M., Metz, M. Nagendra, H., Pareeth, S., Ponti, L., Ricotta, C., Rizzoli, A. Schaab, G., Zebisch, M., Zorer, R., and Neteler, M. 2015. Potential of remote sensing to predict species invasions: a modelling perspective. Progress in Physical Geography 39, 283–309. My past research interests have focused on using geographic information systems (GIS) and remote sensing data for predicting patterns of species richness and rarity for plants and birds at a regional spatial scale. My botanical research will continue to focus on surveying tropical dry forests in biodiversity hotspots. I have collected floristic data from Wallacea, Sundaland, Indo-Burma, Mesoamerica, New Caledonia, and Caribbean hotspots and within four years, I will collect data from a number of other tropical dry forests in biodiversity hotspots. This research is field intensive and taxonomically challenging but provides comparative floristic and structural data for regions where relatively little information exists. This research will result in a number of publications on global conservation priorities, natural resource management, and tropical ecology and will be used as ground truth data for remote sensing studies of anthropogenic disturbance and estimates of forest biomass. My faunal research has focused predominately on tropical bird communities, but I have published papers on mammal and herpetofauna diversity. My long-term research agenda for fauna will focus primarily on combining detailed natural history and field data with remote sensing data to model species distributions and probability of extinction in fragmented landscapes. Models of species distributions will also be examined for a number of environmental change scenarios to predict the future distribution of species. My remote sensing research is divided into airborne and spaceborne sensors that can be used to measure and monitor terrestrial vegetation. My spaceborne sensor research focuses specifically on high-resolution data from Landsat and IKONOS satellites to test hypotheses on the utility of these sensors for predicting floristic composition and structure in fragmented landscapes and to develop new algorithms that predict the distribution and abundance of endangered species. Advances in geographic information systems and remote sensing techniques have resulted in a number of landscape metrics and indices that may be used to predict the distribution of species richness in habitat fragments. I am currently testing the utility and accuracy of landscape metrics and remote sensing indices for predicting patterns of woody plant species richness and rarity in tropical dry forests of south Florida and Oceania. In particular, I focus on testing the accuracy of landscape metrics within three fragmented systems: anthropogenic fragments, natural habitat fragments, and true islands. The long-term goal is to develop algorithms that predict the distribution of plants and endangered species in other tropical dry forest regions and California ecosystems.